myblu™ Blue Ice Liquidpods bring together two of the most popular vape juice flavors for an irresistibly cool and fruity vape. Blending rich blueberry with icy menthol, myblu Blue Ice Liquidpods are great as a refreshing all-day vape. myblu™ Liquidpods are easy to replace: simply pop out your finished pod and click in a new one and you’re ready to vape! 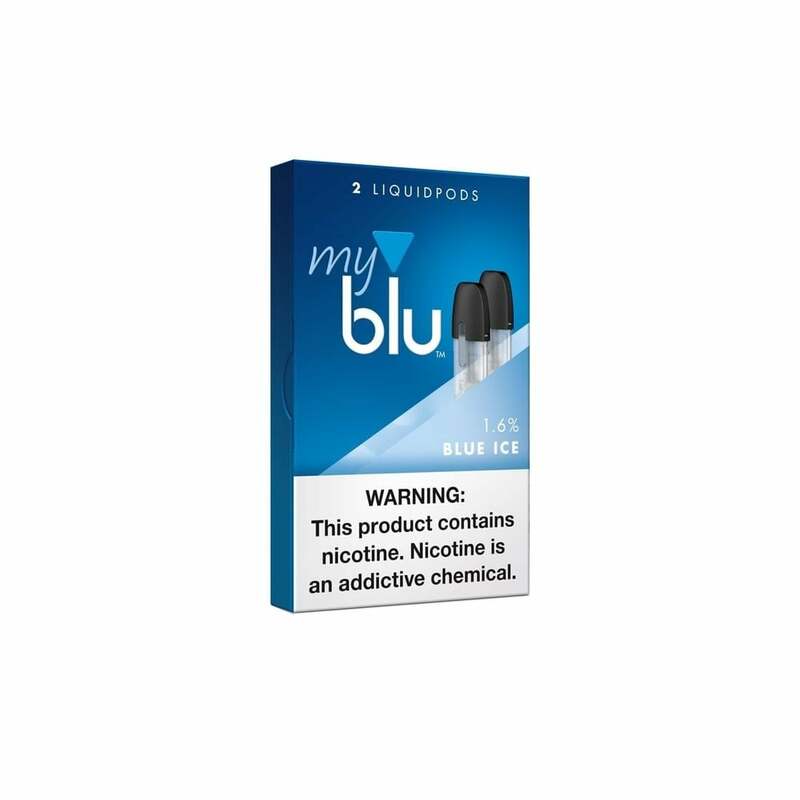 These myblu™ Liquidpods have a 1.5ml vape juice capacity and come in 16mg (1.6%) nicotine. Their organic cotton wick gives you outstanding flavor and satisfying vapor production. Awesome mint flavor, highly recommended! I really wanted to love this but pod after pod leaked really bad to the point after purchasing the starter kit + 2 packs (4 packs) of pod replacements that not one pod was fully usable. I've only tried 3 vapors but the pods on this one have been by far the worst. So far this is the only flavor from myblu I have found that is not only good but also not harsh and will not leave a horrible aftertaste. It’s very cool, and refreshing with the taste that reminds me of a berry lemonade icy. If you were going to give the myblu a try then I suggest getting blue ice as your pods! Blue Ice so far is the ONLY MyBlu flavor I have liked, and man it does not disappoint! Very much like a berry lemonade icee and is way tastier than anything JUUL currently offers. I would highly recommend this one! I thought this was going to be some kind of mint-like flavor but it’s more like a grape flavor to me personally. I really like it.